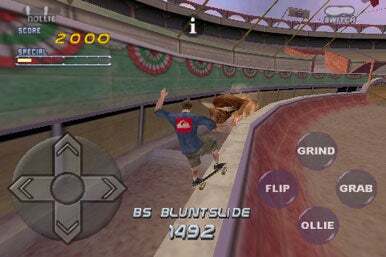 Though lost among the weekend iPad shuffle, game publisher Activision announced on Thursday Tony Hawk’s Pro Skater 2 for iPhone and iPod touch. Now available on the App Store, this $10 app features classic gameplay, game modes, and levels from the hit console skate simulator. Fans nostalgic for the glory days of console skating can grind rails on the famous school level, hit big air by the beach, and play as some of their favorite characters (with their signature moves) once again. Early screens indicate the controls will rely on four multi-function buttons and a virtual joystick. Activision’s press release boasts that players can grab, kick-flip, ollie, and grind just like the original version. But the Tony Hawk games have gained fame for not only their physics-defying jumps, but for the variety of tricks you can do. On a single jump, you could throw down a kick-flip, a 360-melon, and then land on a rail and continue the trick for enormous points. While such tricks are physically impossible for skaters to actually pull off (without bones made of steel, at least), such acrobatic wizardry is expected of a Tony Hawk game. The franchise revels in the ridiculous. Hopefully the iPhone version will grant such players a ridiculous arsenal of tricks to play with.